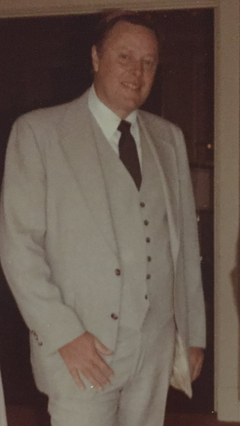 Wayne A. Hanson, 87, of Sidney and formerly of San Antonio Tx, passed away on January 24, 2019 at 3:10am, at Dorothy Love Retirement Community in Sidney. He was born on February 28,1931, in Cincinnati, the son of Andrew and Ruby (Bennett) Hanson. On December 23,1950, he married the love of his life, Betty Ann Bush, and she preceded him in death. Wayne graduated from Miami University, with a Bachelors in Business and Economics, and was a member of the Lambda Chi Alpha Fraternity on campus. He lived most of his life in San Antonio, and retired from IBM where he was the Top Saleman in Texas. He was a member of St. Paul's Episcopal Church in Dayton, Ohio. He is survived by his children, Greg (Kathy) Hanson, of Walnut Creek CA, Todd (Christa) Hanson, of Vosta CA, and Kimberly (Gary) Scheffler of San Antonio Tx. His son Steve Hanson, preceded him in death in 2015. Wayne had a brother, Gene Hanson, and sister, Janis Beigel who both survive. He had several grandchildren: Jason (Ginny) Hanson of Hawaii, Joe Hanson of Tx, Danielle Wright, of Tx , Adrienne Davis of Tx, Shane Scheffler of Tx, Brittany Hanson of CA, Brooke Hanson of CA, and Derek Hanson of CA.